In an evolving energy market where renewable energy sources (RES) are taking up an increasing share in the electricity mix, grid balancing and electricity storage are becoming very important topics. In this context, surpluses of renewable electricity can be used to produce green hydrogen (via water electrolysis). 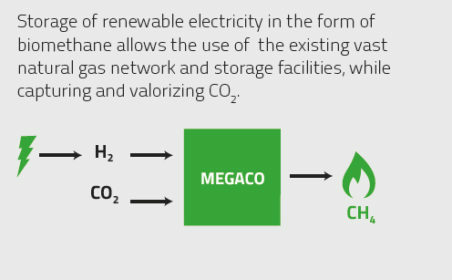 The MEGACO (Methanation Gas Conversion) technology uses anaerobic microorganisms which combine this hydrogen with CO2 to produce methane (CH4). This methane can then be injected into the existing natural gas grid or directly used in mobility (SNG) or chemistry (chemical building block). 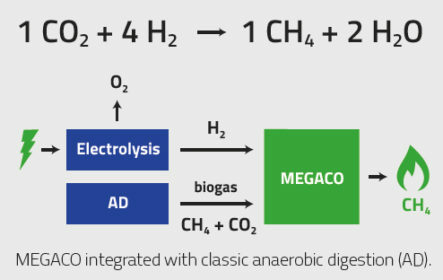 MEGACO is a process that could be integrated with classic anaerobic digestion (AD). Biogas produced during the anaerobic digestion of e.g. municipal waste is composed of 55%vol CH4 and 45%vol CO2. By combining this CO2 and hydrogen in the MEGACO reactor, the CO2 from the biogas is upgraded to extra methane through a process called microbial methanation. Hydrogen and CO2 can be converted to methane with a cost of € 4 – 6 / MWh CH4 (€ 0.04 – 0.06 / Nm³ CH4). 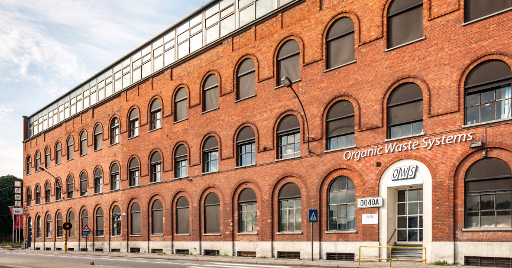 Organic Waste Systems (OWS) has developed the MEGACO process as a solution for the growing imbalance on electricity markets due to the increased share of RES, while also providing a valuable CCU service (Carbon Capture and Utilization). The MEGACO process was developed on lab-scale and was validated on pilot-scale. OWS is currently looking for opportunities to demonstrate this new technology on an industrial scale. For more information: please do contact Mr. Jan Smis.